If you’re a fan of one of the 20 NFL teams that didn’t make the playoffs, the next event you have to look forward to is the start of free agency. If you’re in need of weapons offensively, this is not your year. The list of the 10 most notable offensive free agents is barren to say the least. That, however, is good news for these gentlemen, as it should push their price tags skyward. 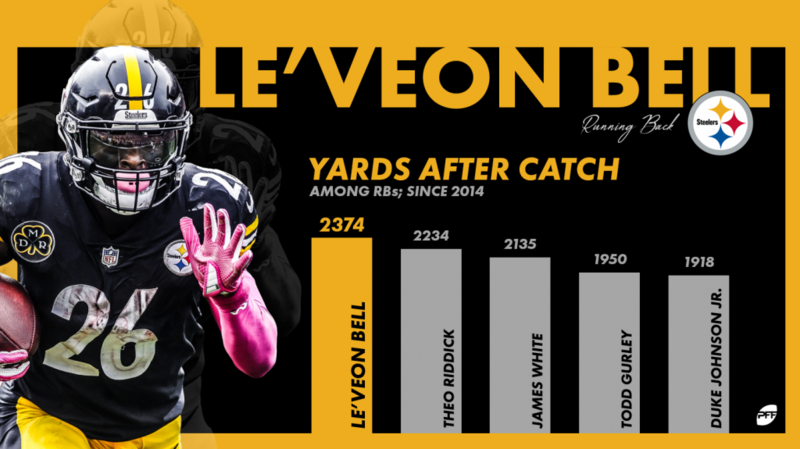 He may have played more basketball than football this year, but there’s no denying Bell is still one of the most talented running backs in the NFL. Back in 2017 he broke 61 tackles, third most of any back in the NFL. His 2.6 yards after contact per attempt was the eighth-best figure of any back with at least 200 carries. For a back that will be only 27 at the start of next season, there’s no reason to think he won’t be back at his best in 2019. Paradis ranked inside the top-three at center this season before ending up on IR. It’s a shame he couldn’t finish it out for the season, but he still more than proved he’s deserving of a big contract this offseason. Paradis has allowed one sack in the past two seasons and is the definition of a complete center. There has been no more consistently elusive wide receiver in the NFL over the past five years. Tate has broken 20-plus tackles after the catch in every season since 2011. Tate may not be your prototypical ‘X’ receiver, but few are as deadly on screens and underneath. If you already have an established number one receiver, Tate can take your offense to the next level. James is going to be an intriguing free agent option for two big reasons. 1. Tackles are coveted heavily in free agency. 2. He’s a former first-rounder with an upward trajectory to his career. James allowed all of 26 pressures this past season, the lowest total of his career. At not even 27 years old yet, James is in line for a big deal. Saffold may not be an elite guard, but he’s been in the tier below for quite some time. He’s allowed all of 47 pressures over the last two seasons and been a top-10 graded guard both years. At 30-years old, looking for his third contract, Saffold won’t command huge money. He certainly has a handful of productive years in him though at this point. While his 59.0 overall grade in Week 17 did little to impress, his preseason performance this past year with the Jets was enough for the Saints to give up a third-round pick. It’s hard to disagree with the Saints assessment of his talent either. Bridgewater very much looked back to his pre-injury form when he earned 75.6 and 71.5 overall grades in his first two seasons. The ultimate wild card, but his highs are undeniable. His 96.1 and 96.3 overall grades in Weeks 1 and 2 were two of the highest-graded games from any quarterback this season. At the same time, he managed 15 turnover-worthy plays in under half a season (Eli Manning led the league with 25). That may not be a desirable trait for a starting job around the league, but if you need someone who can come in and win a game in a pinch, Fitzpatrick is your man. Whether it was drops or inconsistent quarterback play, Cook’s career has been a series of teasing high-level play without putting together a full season of it. His 81.5 receiving grade this past year in Oakland, however, is the highest of his career. At 32 years old, he likely won’t be coveted on much more than a short-term deal, but he quite clearly still has a lot left in the tank. With yet another season ending up on IR, Eifert has officially moved from injury risk to injury liability territory. In his six seasons, Eifert has played all of 2,173 snaps. He’s never once played in all 16 games and has played under 150 snaps in three of those years. Even still, before going down for the season last year, Eifert teased his high-level ability. He was coming off a 74-yard performance against the Panthers where all six of his catches went for first downs when he broke his ankle in Atlanta. Talent-wise, he’s one of the most dynamic in the league, but that’s never been the question with him. The talk about Brown being ‘transformed’ by Dante Scarnecchia in New England is vastly overblown. He allowed nearly the same amount of pressures he did in his last full season in San Francisco (35 vs. 39 in 2016). While he gave up half as many sacks, his 12 hits allowed were the second-most of any tackle. Brown pretty much is what he is at this point; an incredibly large man who will alternate whiffs with dominant blocks.